It has been raining a lot here in Iowa and we’ve had many baseball games and events cancelled because of it. My kids absolutely do not like rainy days spent inside but I try to find fun things for us to do indoors. Every week I have each child pick a snack or dessert to help me make for the family. This gives us something to do on those rainy days and gives them responsibility and some fun one-on-one time. This week Priscilla chose fruit pizzas. 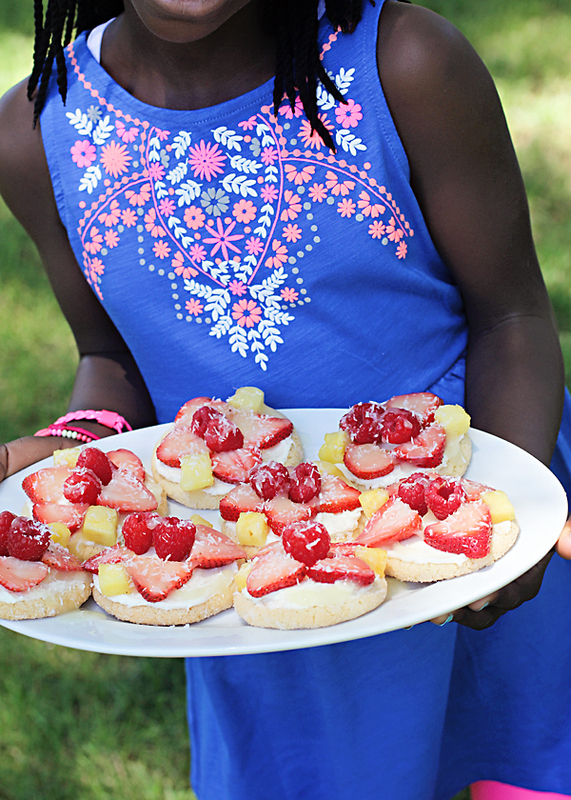 We made these semi-homemade fruit pizzas with store-bought sugar cookies, but you could make your own as well. We made these extra tasty with a pineapple glaze and shredded coconut. 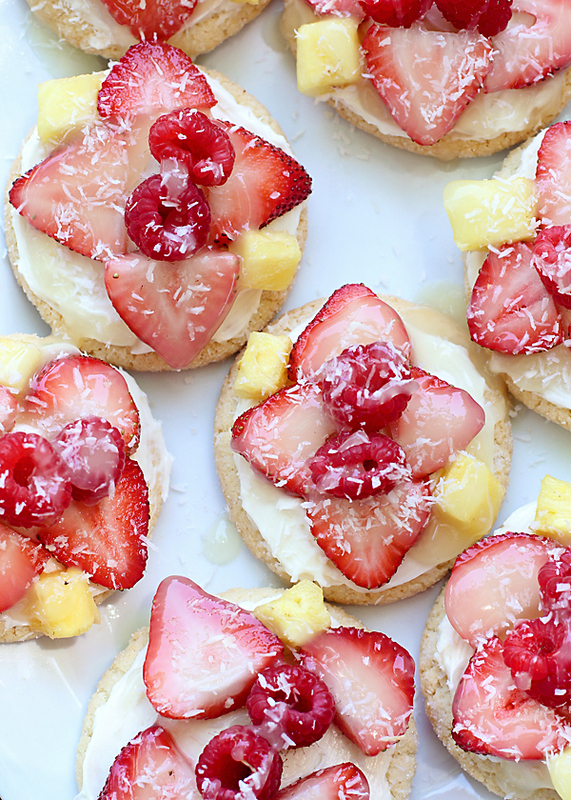 We like to call them Tropical fruit pizzas! These are definitely a summer treat. Luckily, the rain doesn’t last for long here and most of the summer days end up sunny so the kids can at least get outside for a little bit. As you can tell from the photos Priscilla was excited to get outside! 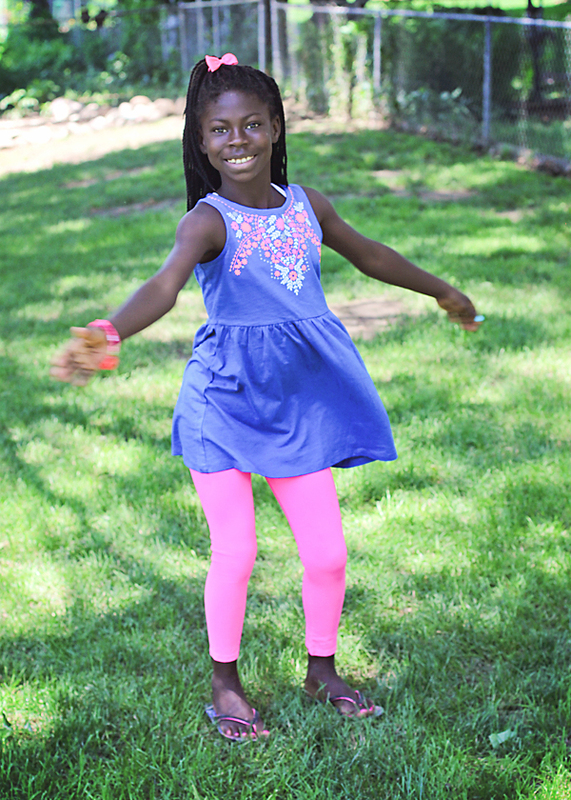 I love the versatility of OshKosh clothing and how it’s comfortable enough for a rainy day spent inside, a play date at the park or even dressy enough to go somewhere special, especially the tunics and leggings. I remember those cute baby OshKosh B’Gosh overalls I had for my son many years ago. I didn’t realize OshKosh had some fashionable looks beyond the traditional style I remember and they go up to both boys and girls up to size 12! Beat the cream cheese, powdered sugar and vanilla together in a mixer until combined. Meanwhile, combine the sugar and cornstarch into a bowl. Heat a small saucepan over medium high heat and add the water and fruit juices. Whisk in the sugar and cornstarch and bring to a boil. Boil for about one minute until thickened. Let the pineapple glaze cool for a few minutes in the fridge. Spread the frosting on each of the cookies, top with the sliced fruit and drizzle a little glaze on each cookie. 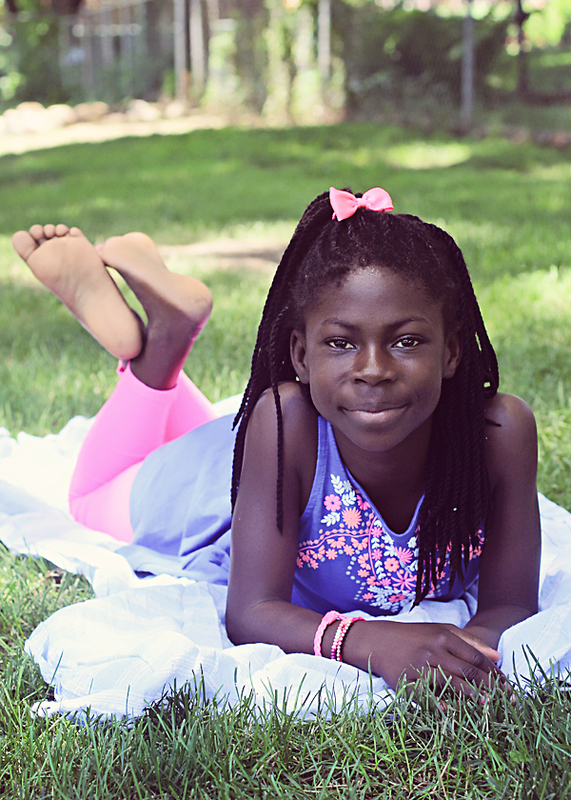 Don’t know if there is an OshKosh B’Gosh store near you? Check out this store locater and be sure to print this 25% off coupon below before you head out to buy some fashionable summer outfits. These look so yummy and like they would be easy enough to make with my kiddos. As much as we love being outdoors, we’re not fans of rainy days either.